This is most people’s destination on the Georgian Military highway: a valley town with the famous hilltop silhouette of Tsminda Sameba(Trinity) Church and the towering snowy cone of Mt Kazbek looking down from the west. Now officially named Stepantsminda, but still commonly known as Kazbegi, it's a base for some wonderful walking and mountain-biking. 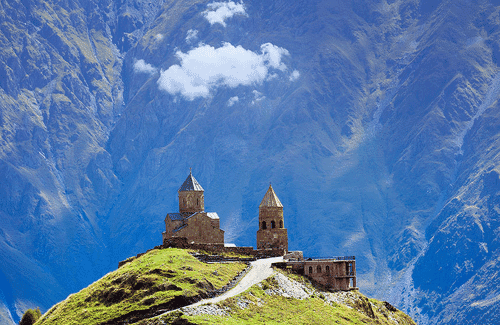 In this 1 day tour you have a possibility to see: Zhinvali water reservoir, Ananuri Fortress, Dariali Gorge and Gergeti Mountain – Trinity Church.